A side return infill extension with an industrial style. Extensive use of reclaimed materials, high standards of insulation and a wildflower green roof. We completed this project late on last year working with Clements Design as the architects. The project aimed to turn a cramped kitchen into a spacious area for cooking, eating and socialising. There is an industrial and sustainability theme to the project, the materials used are often from or designed for factories. Electrics are contained in galvanised metal conduit and the floor is concrete. Walls are exposed brick, both reclaimed glazed brick and the existing London stock bricks revealed to the world. The large glass panels to the roof draw in light to what was once a dark area and bring out the rich colours in the reclaimed wood cladding. Though the materials could be seen as austere they are softened by the contents of the room that reflect family life, there is space for a large wooden toy stove, a comfy sofa and a gorgeous oak dining table with mismatched chairs. The large rear doors mean the garden can be seen and accessed easily from the house, the doors can be flung open in the summer for barbecues. The green roof will develop over time but already has wildflowers peeking over the parapet and they can be seen swaying through the glass roof. The project was also designed in conjunction with the neighbours and they share the party wall and the box gutter. Sustainability was a key part of the client’s aim for the project. Reclaimed materials were used wherever possible. All the bricks removed in the demolition stage were cleaned and re-used onsite to build the new structure. Internally there are two walls of glazed bricks reclaimed from a lift shaft in Kensington. The other walls are the original brick exposed and insulated on the outside where appropriate. The bi-fold doors are triple glazed with a u-value of 1.09 are factory finished for long life and are made from environmentally sourced timber from sustainable forests. The heating is underfloor and utilises the existing condensing boiler, three Nest controls were added to the system to control this and create two new heating zones in the house. 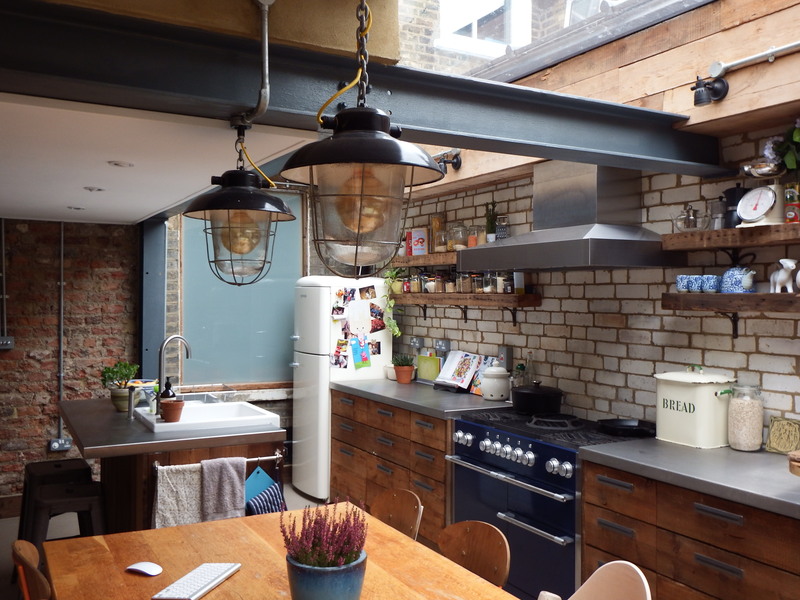 The wood (for drawer fronts, shelves and cladding) is from a reclaimed wood specialist in Guiseley, Leeds, called Machells and is cut down from Yorkshire Victorian mill joists. The large pendant lamps are reclaimed from a 1950’s factory in the Stoke area. The table was made in Leeds from British oak 35 years ago. All the shelf brackets and drawer handles were made in England in foundries using all traditional methods. All lighting is LED, even filament style traditional bulbs are actually LED. The green roof is part plug planted and part seeded with a mixture of wildflowers, meadow plants and some sedums. The roof will flower through most of the year and provide habitat for insects and foraging for birds amongst other biodiversity benefits.